Categories: General Doors and General Windows. 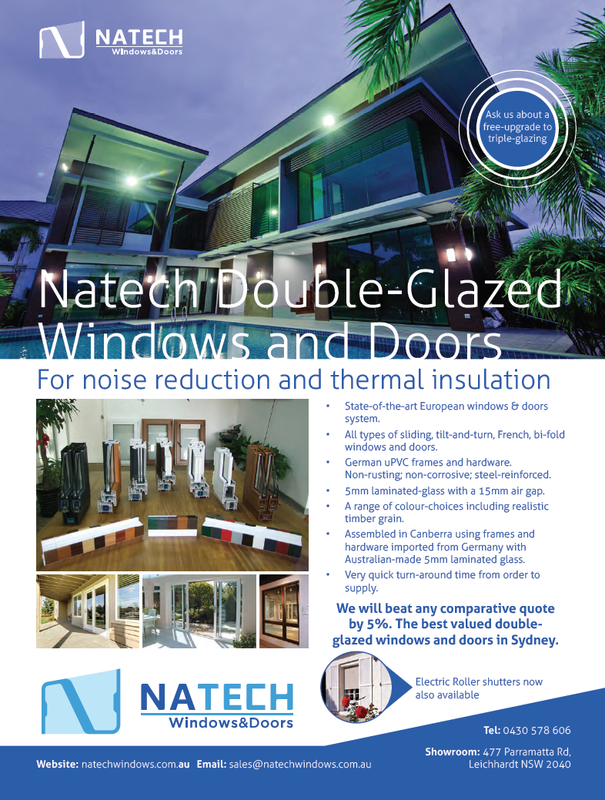 Suppliers: NATECH Windows & Doors. State-of-the-art European windows and doors system. All types of sliding, tilt-and-turn, French, bi-fold windows and doors. German uPVC frames and hardware. Non-rusting; non-corrosive; steel-reinforced. 5mm laminated-glass with a 15mm air gap. A range of colour-choices including realistic timber grain. Assembled in Canberra using frames and hardware imported from Germany; with Australian-made 5mm laminated-glass. Very quick turnaround time from order to supply. 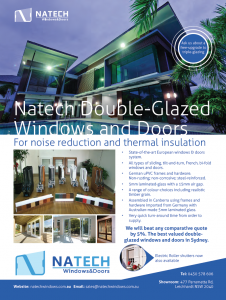 NATECH Windows & Doors will beat any comparative quote by 5%. They claim to offer the best valued double-glazed windows and doors in Sydney. Ask them about a free upgrade to triple-glazing.